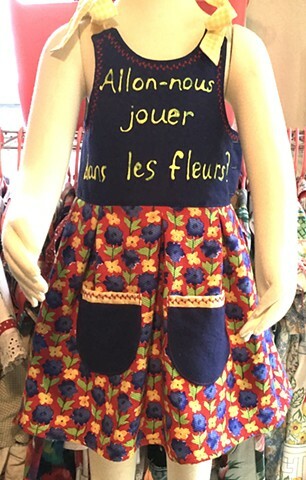 “Allons-Nous Jouer Dans Les Fleurs,” French for “Let’s play in the flowers,” inscribed in day-glo fabric paint on the bodice of a fun summer frock, sized Toddler (3-4 years), measures 22” across chest, 21” shoulder to hem. Skirt made of 100% cotton print, navy linen bodice, yellow gingham ties at the shoulder, allowing the dress length to grow with the girl. Decorative stitches around neckline, opens on the side with 3 multi-colored buttons in flower shapes, $80, made by the designer herself and shipped free to any address in the U.S.